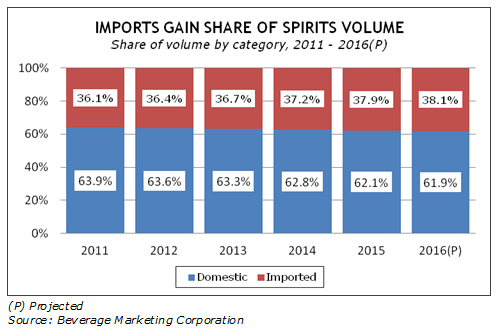 New York, NY, July 2016: Competition among beer, distilled spirits and wine has heated up in the United States over the last five years as consumers continue to seek variety and trade up to higher priced products. This has driven record innovation in both product format and flavor, which has supported the craft movement in both beer and spirits. The beer category performance has been driven by three segments. 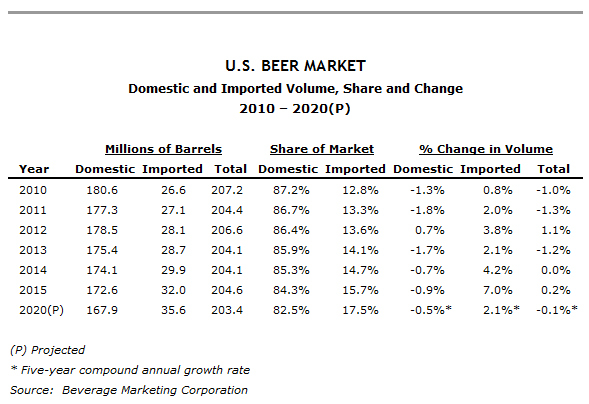 Imported beers, particularly Mexican imports, which account for 62% of all imported beer, have done very well, with volume enlarging by 7% in 2015, according to data from Beverage Marketing Corporation. Craft beers continued to grow, although not at the high rates seen a few years ago. Their volume increased by 10.5% in 2015, but single–digit growth looks likely in the years ahead. The segment's growth in particular is coming from more flavors and varieties, with IPAs making a sizeable impact and sour beers becoming vogue. In addition, the craft category is becoming more local as new entries continue to move at a brisk pace with over 4,000 craft brewers now in existence. Flavored malt beverages (FMBs) comprise the third growing segment, and were up by a rate similar to the craft segment's. Hard sodas, a newer FBM sub–segment, have been growing by near –triple–digit rates. As with earlier variations in the FMB theme (think Zima), such growth might not be sustainable over the long term. Wine growth continues to be driven by table wine, which holds a 90% share of the market. Not only are domestic wines doing well, but smaller–volume brands from different locales are also outperforming the overall market. Sparkling wine, particularly Prosecco, remains strong. With spirits, the story continues to be the enlargement of whiskey. With more craft distillers coming online, competition has become fierce. While whiskey overall moved at the same 1.7% rate of growth as total distilled spirits volume in 2015, American straight whiskey advanced at a significantly faster rate. Although flavored whiskey growth has slowed, this segment remains a driver for the overall category by bringing in more consumers. The vodka segment has stabilized, with suppliers paring down their portfolios and focusing on a few stalwart flavors. The days of growth coming from confectionery flavors has ended. Tequila continues its near–5% growth, with especially strong showings among the high–end offerings. Cognac is another hot segment of the market. Overall, suppliers are competing for millennial consumers whose preferences change rapidly and are always seeking the next new thing. This has made the marketplace very dynamic with innovation at the forefront. However, the lifecycle of these products seem to be only a few years, and if there's no new innovation in the pipeline, then growth cannot be sustained. New York City–based Beverage Marketing Corporation (BMC) is the leading research, consulting and financial services firm dedicated to the global beverage industry. In 2016, the company launched a new series of three reports – BMC's U.S. Spirits Guide 2016, BMC's U.S. Beer Guide 2016 and BMC's U.S. Wine Guide 2016 – all of which are currently available.